Heat the oven to 425°. In a small saucepan, combine the apricots and water. Bring to a boil, lower the heat, and then simmer, partially covered, for 10 minutes. Set aside. Toast the almonds and sesame seeds in the oven until just beginning to brown, about 2 minutes. Transfer 1/3 cup of the almonds and 1/4 cup of the sesame seeds to a blender; pulverize with the cumin, coriander, paprika, oregano, and 1/2 teaspoon salt. Put the mixture in a small bowl; stir in the oil and lemon juice to make a paste. Stir half of the paste into the apricots and water. Put the chicken breasts in a small roasting pan, skin-side up, and coat with the remaining paste. Pour the apricot mixture around the chicken. Cook in the lower third of the oven until done, 20 to 25 minutes. If the chicken seems to be browning too quickly, cover the pan with aluminum foil the last 10 minutes of cooking. Transfer the chicken to a plate. Spoon the fat from the pan. 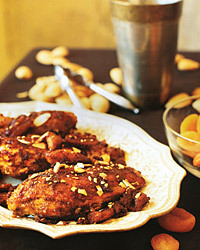 Serve the chicken topped with the apricots and any pan juices. Sprinkle the remaining almonds and sesame seeds over all. Steamed rice is an ideal accompaniment. So are roasted potatoes cooked alongside the chicken in a separate pan. A red or white wine with low tannin and plenty of fruit flavor will match the sweet, tangy apricots. For a red, a Pinot Noir from Oregon would be a good choice; for a white, a Pinot Blanc from Alsace in France. Review Body: I love this recipe and use it often. It's easy, healthy, and a big departure from the usual weekday chicken meals. I use boneless chicken breasts and it turns out great!